The Centre expanded its economic indicators program in 2002 to the Upper Hunter Region based on data collected six-monthly from households and businesses using Upper Hunter Pulse surveys. 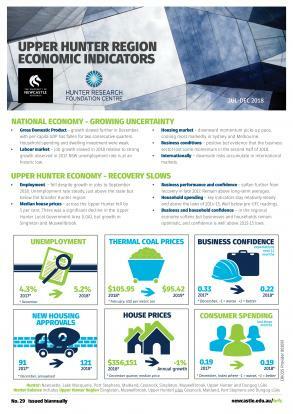 The key findings are published six-monthly as Upper Hunter Region Economic Indicators, and released at our economic breakfast function held in Muswellbrook. Back copies of the publication are available on request.